I am dealing with my Moroccan hangover and don’t feel like I have said all that there is to say. 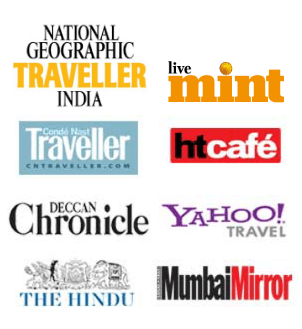 Today my mind wandered to all the amazing food that we ate through out trip and yes food is an integral part of travel. 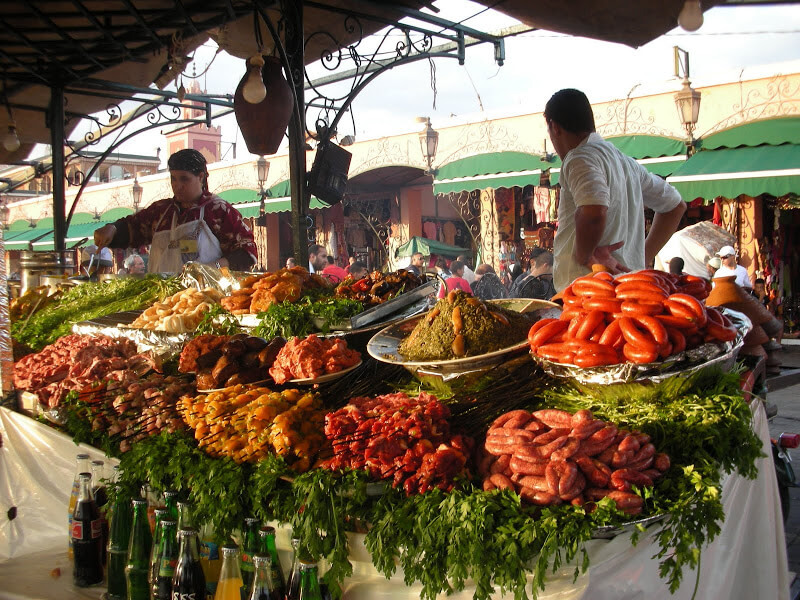 Moroccan cuisine is popular the world over and in fact it manages to garner a lot of tourist interest. I know of some foodies who want to go Morocco just for the food. Being a vegetarian I had no problems with food anywhere and no I did not eat pizza and pasta all the time! I tried a lot of the local dishes – Tajine, Couscous, Harira, Bessara and more. Thanks to the Mediterranean weather that Morocco is blessed with, oranges and olives are found in abundance. We never tired of drinking fresh orange juice all the time that we were there. Another local favourite is a mixed fruit drink called Panache. 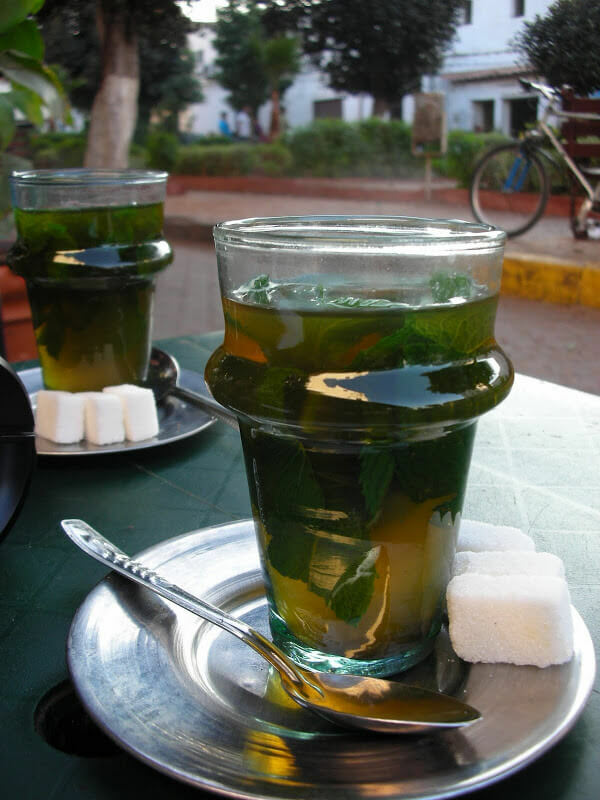 But the king of all beverages is B’nana or Moroccan whisky – green tea with mint. A good B’nana has a lot of mint added to lightly flavored tea and the locals love it sweet! We started out asking for the sugar less version, but by the end of our trip we loved it the local way… very sugary and sweet. Commonly a local meal started with a helping of olives. We ate olives and we ate olives, and didn’t tire of it. In fact we picked up two bottles each to bring back. 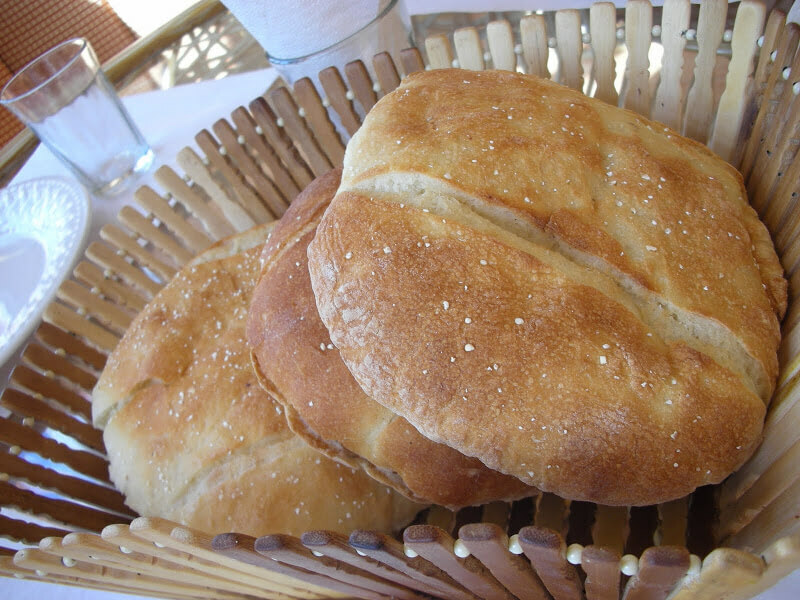 The local bread is known as Khoobz and is brown and crispy on the outside and soft and fluffy on the inside. There is also bread that’s made of semolina. 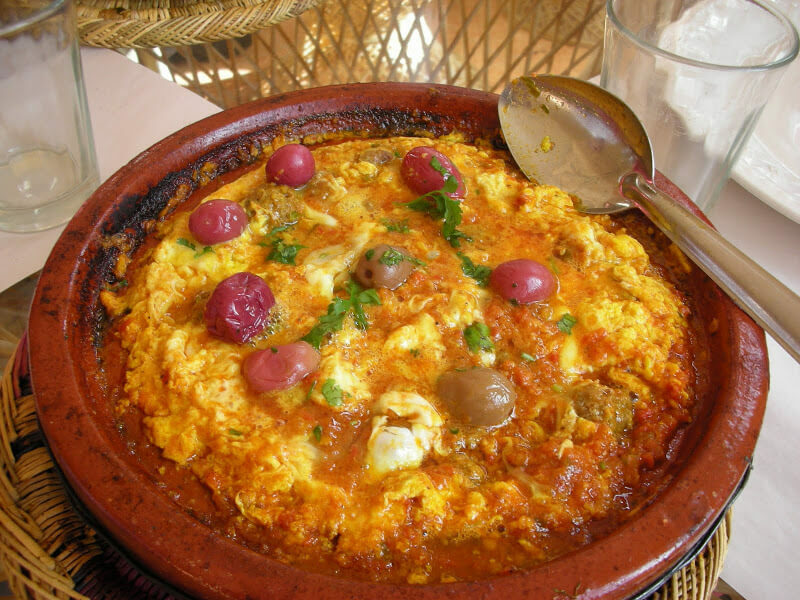 The national dish of Morocco is the Tajine. Made of meat or chicken, with vegetables or just vegetables, this dish has subtle but distinct spices. Cooked in a Tajine – a conical vessel, the dish is served piping hot with freshly made Khoobz. There are several variations, but some of the popular ones are meat with prunes and almonds, meatballs with egg and olives or chicken with lemon and olives. 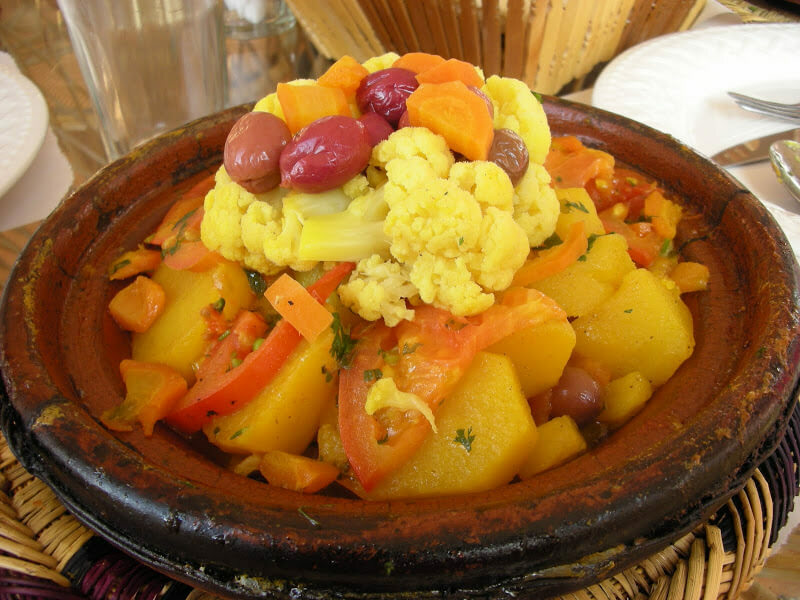 A vegetable Tajine has chunks of potato, carrots, olives, beans and cauliflower cooked with spices and has a think gravy. The other popular dish is Cous cous, which is semolina cooked with spices and topped with vegetables and chicken, and often garnished with caramelised onions and raisins. Cous cous with seven vegetables is a local delicacy and the best kind is found in Casablanca. But the king of Moroccan cuisine is said to be the Pastilla. The Pastilla is a pie made of wafer thin pastry and stuffed with chicken or pigeon, cooked with onions, caramelised almonds, coriander, egg and topped with powdered sugar and cinnamon. It’s heavy and sinful, but definitely worth a try once. Soup is also had for breakfast. Bessara a thick soup made of fava beans and topped with a generous helping of olive oil is the local favourite. We didn’t find this dish on the menu in any restaurant. 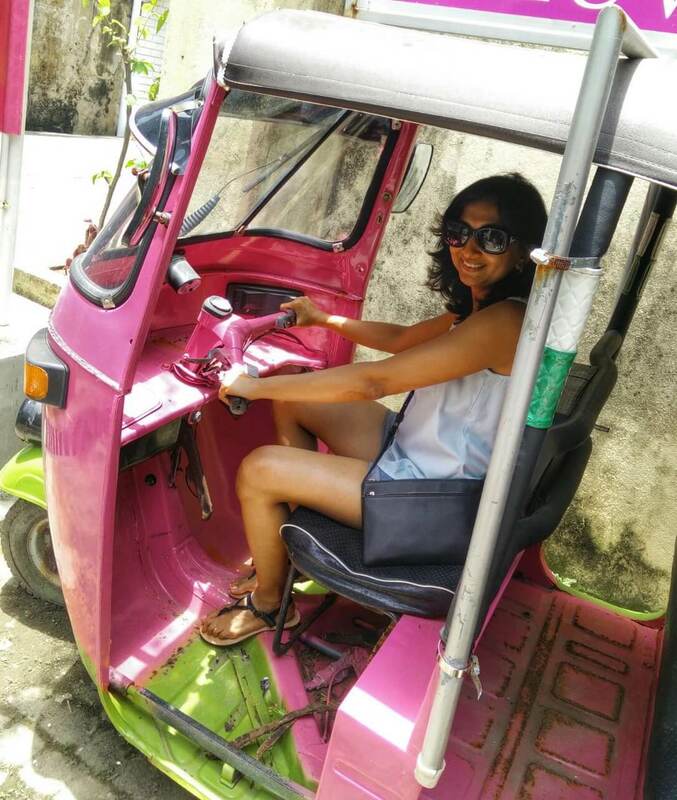 But look around while you are walking around in the morning and you are likely to spot a Bessara stall crowded with locals digging into a bowl full of soup with Khoobz. Desert is usually mint tea served with local pastries. My favourite was a gazelle horn shaped pastry filled with almond paste. One bite and you will want to have one more. From a fancy dinner at a Riad, accompanied by local dance and music, to eating at roadside stalls at Fes and Djemma El Fna, eating is a fun experience in Morocco.